I've had a crazy busy couple of weeks. Mostly, we've been going through my mom's personal stuff and trying to figure out what to do with it. That always means I need to do some decompressing by reading. 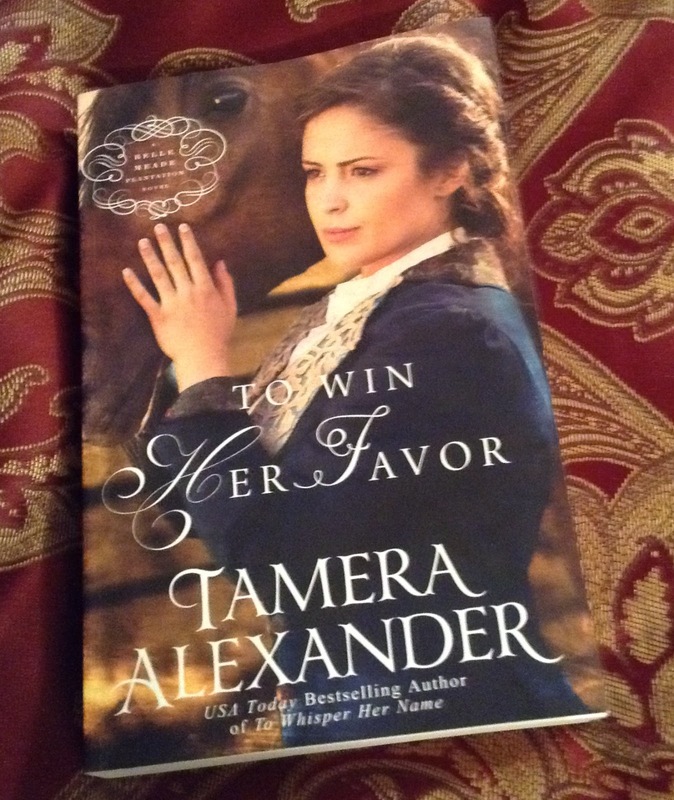 So I was thrilled to receive To Win Her Favor by Tamara Alexander while I was at Dad's. I ended up staying up until 3:30 one morning, because I simply did not want to put it down. An Irish-born son far from home, Cullen McGrath left a once prosperous life in England because of a horse racing scandal that nearly ruined him. He's come to Nashville for a fresh start, hoping to buy land and start a farm, all while determined to stay as far away from thoroughbred racing as possible. But starting over proves harder than he'd wagered, especially when Maggie Linden's father makes him an offer he shouldn't accept yet cannot possibly refuse. Maggie is certain that her mare, Bourbon Belle, can take the top purse in the annual Drayton Stakes at Nashville's racetrack--the richest race run in America. Maggie only needs the chance to prove it. To give her that chance, and to save Linden Downs from being sold to the highest bidder, Maggie's father--aging, yet wily as ever--makes a barter. His agreement includes one tiny, troublesome detail--Maggie must marry a man she's never met. A man she never would have chosen for herself. Cullen and Maggie need each other in order to achieve their dreams. But their stubborn, wounded hearts--and the escalating violence from a "secret society" responsible for lynchings and midnight raids--may prove too much for even two determined souls. I loved this book. I didn't necessarily expect to, as I'm not at all a fan of horse racing and know almost nothing about it. One of my favorite time periods to read about is roughly the 1870s and 1880s, particularly stories taking place on the Plains. This story is just a bit earlier than that, taking place in the South. Something about it just clicked for me. One thing is that I took an immediate liking to almost all of the main characters. I especially loved the relationship between Maggie's father and Cullen, and was really wishing more of their interaction was included. Cullen's relationships with the former slaves were pretty fabulous as well. I did like Maggie also, especially watching her change her opinions on so many issues. Great book, and I am so glad I read it! I am so grateful to Family Christian for this opportunity! I have a $25 Family Christian Appreciation Certificate to give away! You can use that to purchase To Win Her Favor, or anything else you wish. I went to a horse race years and years ago. It was fun.